This simple Laksa soup is a perfect appetizer (or even the main meal!) on a breezy autumn night. 1. 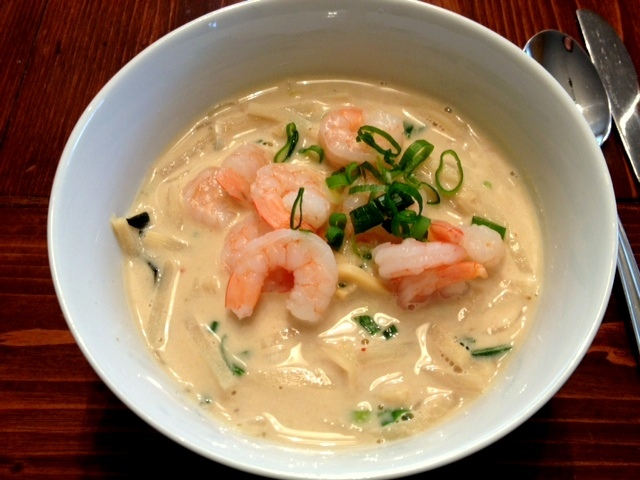 In a pan, boil the coconut milk, vegetable broth and shrimp. 2. Reduce the heat to medium and add thai chilli, bamboo sprout, ginger, 2 chopped scallions, red curry paste, fish sauce, brown sugar, thai basil leaves and vermicelli. Mix well and wait to boil. 3.Serve immediately with a sprinkle of chopped scallion. PS: if you like asian food, having a pot of pre-made red curry paste can be a good investment.